Authored by hein on Apr 10 2018, 10:34 PM. Changed the overall design from two lists to one list with a modal sheet to add more languages. Replaced a modal "You need to relogin for changes" dialog with a MessageType.Positive InlineMessage. Reworked the way missing languages are handled: The old KCM silently rewrote config and showed a warning. The new design shows an informative warning and removes the missing languages on the next save. Until then they're flagged as missing in the list. Manages Apply button state correctly (or rather at all ...). something to work with to fix various Kirigami and SimpleKCM problems. 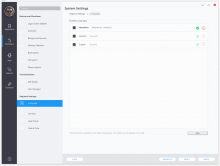 Fix logic bug in managing the sheet's Add button enabled state. Looking at the screenshots, it's unclear which language do the up/down buttons belong to. Can we use drag'n'drop? Can we embed the buttons into the language row next to the language name? On desktops SwipeListItem now shows the actions without the swipe thing on hover. I'd also probably prefer DND though. I'm not a huge fan of the fact that the list items take up the entire horizontal width and have no side borders. Makes things feel rather visually muddy, like things are too big and flowing into one another. Could we put that whole list inside a frame with a reasonable maximum width to give it some visual containment and structure, and have at least a bit of side padding between the edges of that frame and the edges of the KCM? 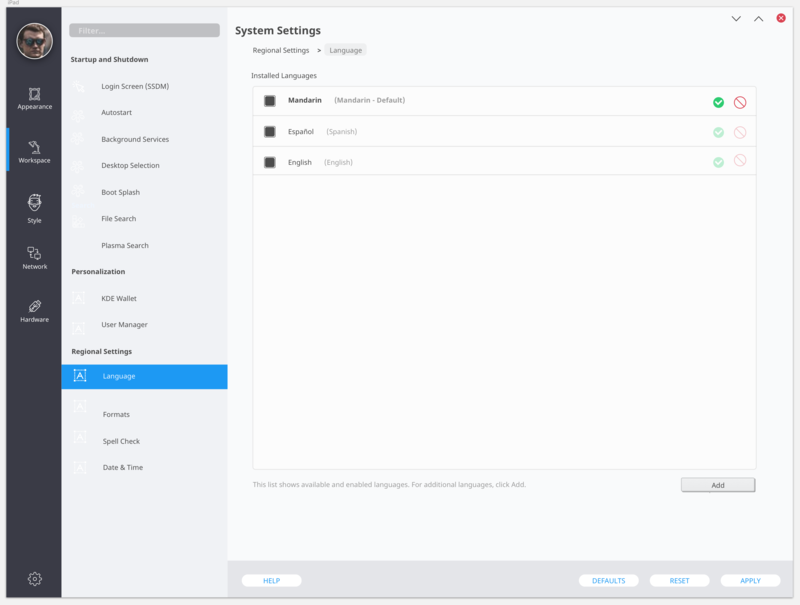 And if this is a Kirigami convergence thing, IMHO we should think about having Kirigami automatically add a frame and some side padding when on desktop platforms, where having a list span the entire horizontal width rarely looks good. Could the list be enclosed by a white field? I think we can do a white field. About the padding, I think it'd be cool if FormLayout could do this somehow. So it's automatic. (This code doesn't use FormLayout currently, though.) @mart? I'm actually having no luck with the white field thing currently. I tried various combos of setting Kirigami.Theme.colorSet: Kirigami.Theme.View in either the LV or the delegate and relying on backgroundColor use in DefaultListItemBackground, or setting SwipeListItem.backgroundColor explicitly, or even using the deprecared Theme.viewBackgroundColor. None of them produced white. Perhaps I'm blind, but in the latest screenshot it looks like there's already a white background. If anything, what we need is for the general background to be light gray like all the other KCMs, and for the list itself to retain its current white background and have a simple frame around it to separate it from the gray background. There's no white bg in the latest screenshot, the entire thing is #fcfcfc (window bg color). Note btw that it's similarly broken for me in the new grid-based KCMs. We had the same discussion there where we want the grids to have the view background color behind them (white), but the grid in the Loon and Feel KCM for example is #fcfcfc for me. OK, the plot thickens. Turns out this is a color scheme problem. We have "Default" and "Breeze" color schemes. They used to be (and are supposed to be) identical. But right now, in my Colors KCM, switching between Default and Breeze produces different results. In "Breeze", the window background color is #eff0f1 and the view background color is #fcfcfc, so you get a noticable contrast. In "Default", they're both #fcfcfc. So the Kirigami colorSet stuff actually works fine. It's the "Default" color scheme making all the colors the same. Set color set, add padding, wrap in ScrollView. This is all a bit hacky and mostly to get VDG feedback. When the lang list grows out of bounds you get double-scrollbars because I couldn't find a way to access the ScrollView background item frame width to size it by. 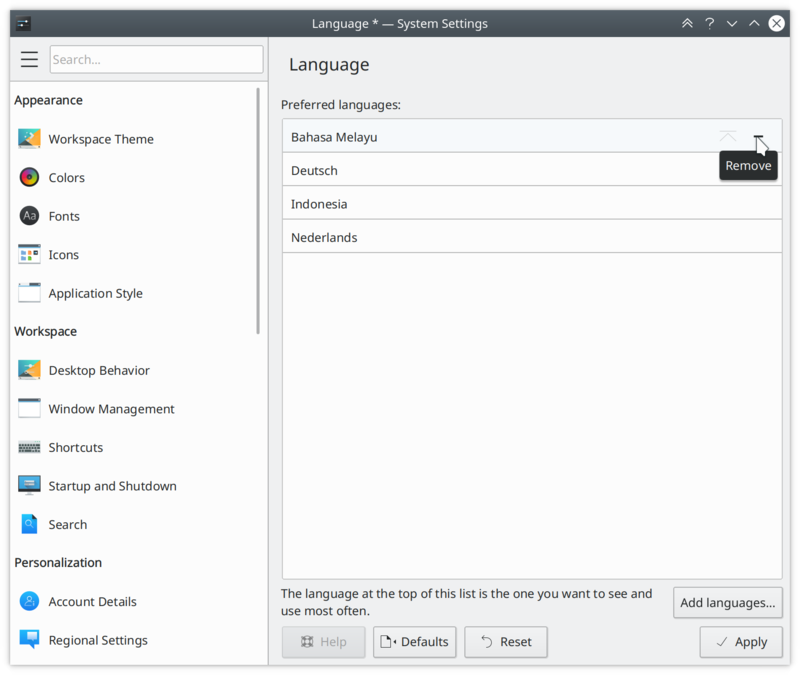 Hm, I could imagine regular users will have a hard time selecting their preferred language. 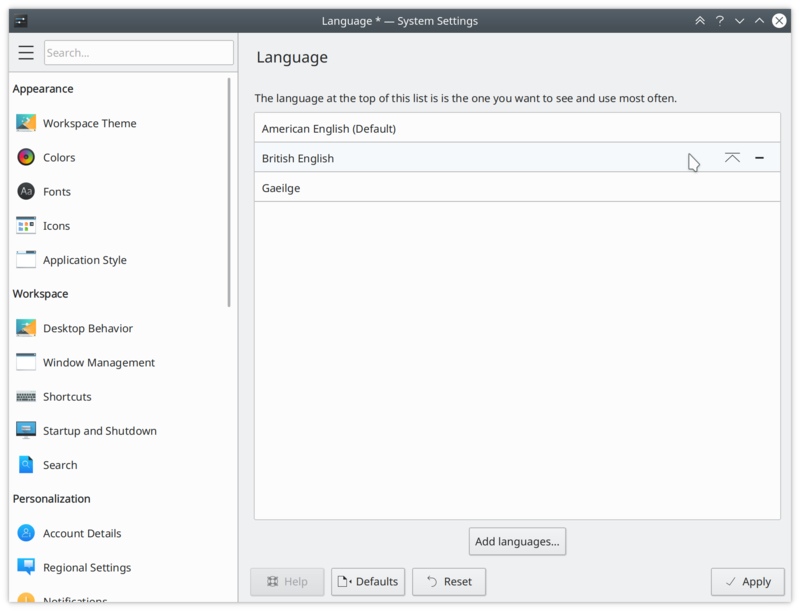 They'll see a list of languages, and look for some kind of checkbox to "select what they want". 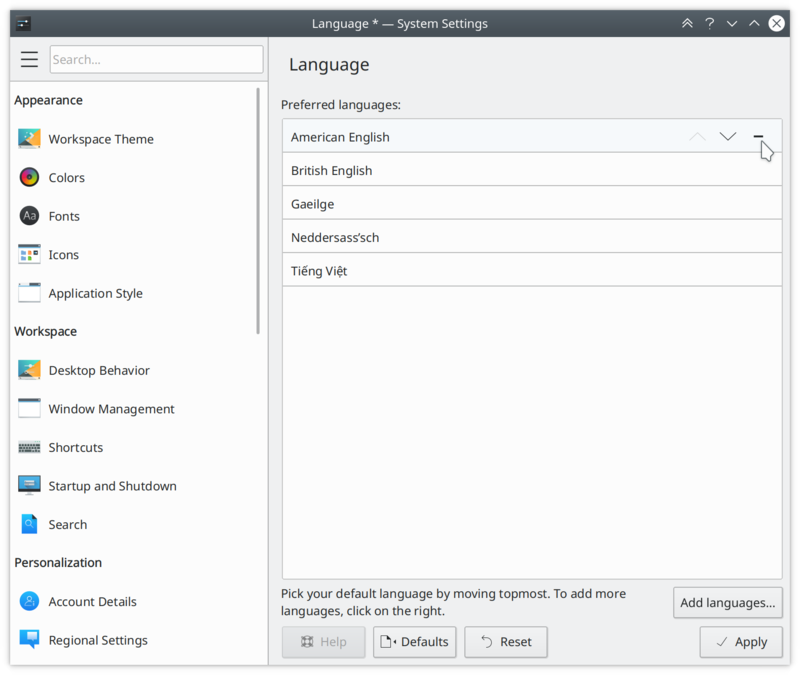 How should they realize that the top-most language will be used as the default, with the languages below as a fallback? This either needs some kind of visual indication, or at least a help text above. 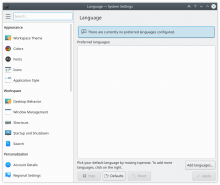 For reference, the language control panel in Windows has this text written above the list: "Add languages you want to use to this list. The language at the top of your list is your primary language (the one you want to see and use most often)." Also, having a Set as default action to move a language to the top in one go would be a bit more pleasant than being forced to use the endless loop of "click on Up button, button moves away, move mouse to target button again, click again…". Drag-reordering is also hard to discover for some type of users. Alternatively, move the Up button out of the list into a static position. The interaction will be a little bit different than that. Correct me anyone if I am wrong. The list of languages you see, are the ones selected. 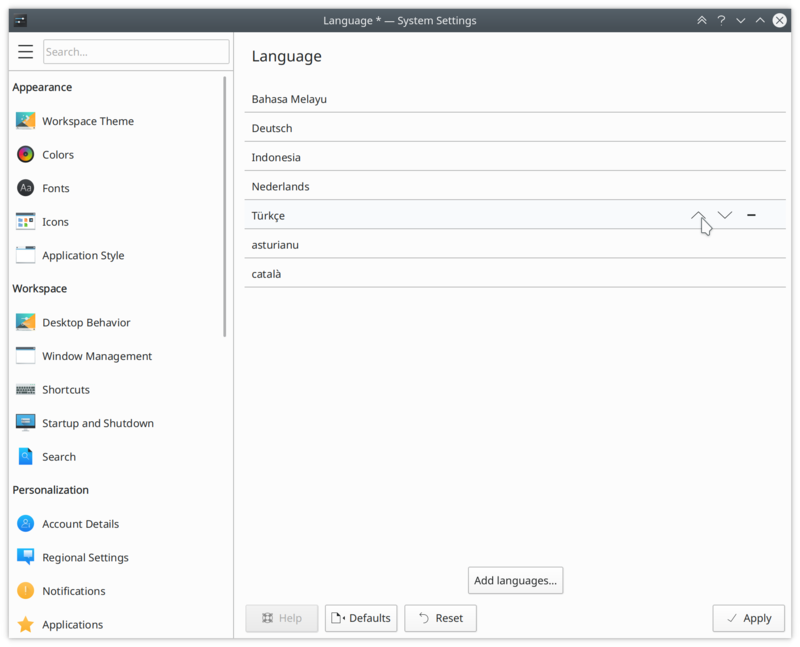 There is another window that has a list of languages to select from. I think @rkflx gets that, he's talking just about the first list. I agree with his comments. Some more design mockups to work from would be nice :). Here are additional mockups for thought. Quite nice (the helpful text label in particular, and how the default option is emphasized), but how will setting the fallback language work, e.g. how to switch English and Spanish around in your screenshot? In the previous iteration this was done by allowing to order the list (which IMO was fine, only needed some polishing). I like the mockup, but yeah, still need to figure out ordering. 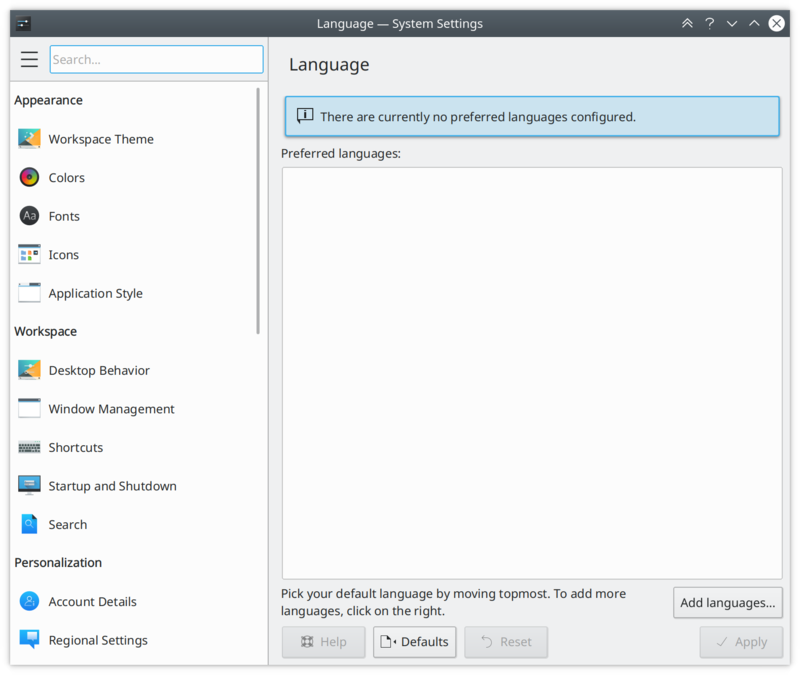 As for the top text label, let's go with "Preferred languages" over "Installed languages" (also what the old KCM used). 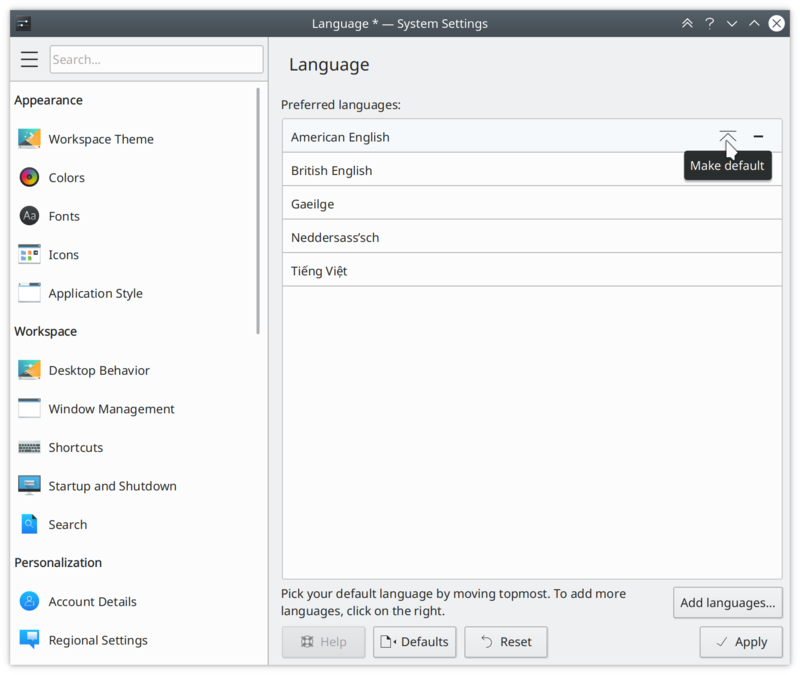 Pick your default language by moving topmost. To add more languages, click on the right. The language at the top of this list is the one you want to see and use most often. To add more languages, click the "Add Languages..." button. Yeah, I think duplicating the button text is goofy. I'm OK with the first sentence. That'd address @rkflx "make changing the default super easy" thing. BTW: I think SwipeListItem actions should have support for tooltips, so those actions can have "Make default" and "Remove" tooltips. Another issue I have with SwipeListItem: In addition to the hover effect, there's always a fancy flashing effect on clicks, even though it doesn't do anything in my list. +1, that would be excellent. Also +1 for further refining the usability and presentation of the SwipeListItems in the way you bring up. So, how are we gonna approach this drag thing? Three dots? For this list, where the items themselves don't do anything on click, I think it's sane to allow the whole list item to be a drag area. There's more of a challenge to allow re-ordering items that do something when you click on them, but we don't have that issue here. We need some sort of cue so people can tell it's draggable though. One more note: Users read the dialog from the top. Having "Default" added to the topmost entry like in @abetts' mockup would be great, if possible at all, because most users won't really get to the text at the bottom. As for the handle, maybe something like http://clauderic.github.io/react-sortable-hoc/, (see "Drag Handle" and "Lock axis", observe cursor changing). This icon is pretty standard in both web and Android, unfortunately overloaded with many other meanings, too. I guess this needs to be a Kirigami-wide decision, or do we have an existing example? +1 for putting the text on the top rather than the bottom. Once we make the list draggable, it might be nice to incorporate that into the text too, e.g "drag languages into your preferred order" or something like that. Unfortunately, our use of the hamburger button precludes use of that elsewhere-fairly-universal "three bar" symbol to mean "this is draggable!" Maybe a very light gray rendition of this, or a variant? Adding 'Default' is pretty easy, no problem. It's now done aside from dragging stuff and ... uh ... saving settings. Is the Add Languages button able to be right aligned? Did we want to include the helper text from previous iterations? 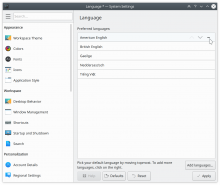 ngraham added a task: T7247: Language. Right-aligned button: Can do, sure. Helper text: It's at the top now, AIUI the discussion had evolved to leave it like this? Not sure. Layout. * attached properties are useless there, as items in a listview are not in a layout. @mart Do you think I should push this before we work on the DND stuff? 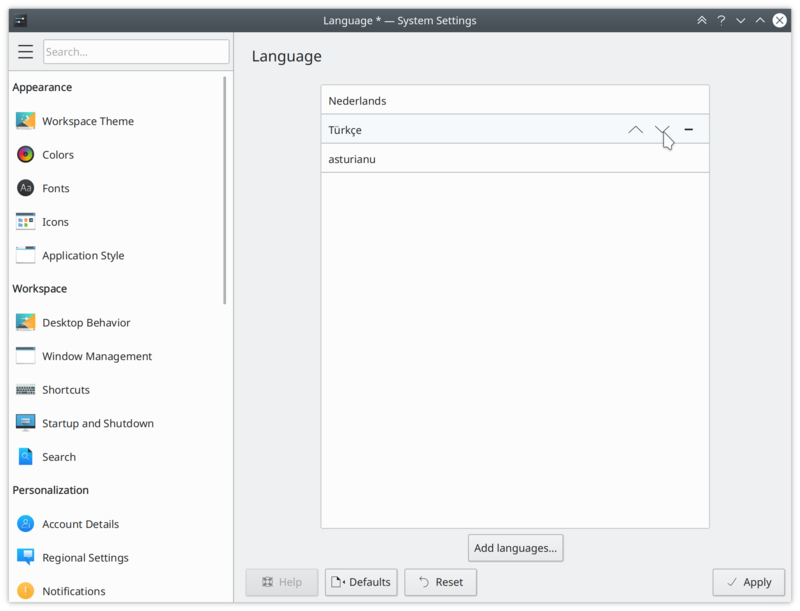 if i select more than one language, only one will be added, the others will be added as "unknown"
I can't reproduce this, but will have a look. Remove width from delegate in sheet again. 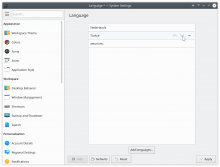 Don't mutate source model while building list of langs to add to selection. This will likely fix Marco's problem. Add back Move up/down actions. settings ... - we still want this in 5.13. To prepare for DND, the model now has a method to do the moves. costly model reset. This is much smoother in the view. and speed up the UX. Please re-review now for 5.13 inclusion. Please, can I ask why is it impossible now to configure the keyboard layout as a result of this? That was a mistake. It has been restored. Sorry, accident! The code in the Keyboard KCM is ... interesting and literally breaks my system trying to build it (it needs a two-digit amount of GB of memory to build thanks to a boost-based keyboard layout preview generator it even changes the LLVM template recursion depth for), so I usually disable it so I don't have to hard reset my PC and lose data. One about drag & drop is probably fixed by this, the majority need triaging to kcm_formats. Interestingly no mention of it not saving. I've cleaned this up/out now. About half or so got reassigned to either systemsettings:kcm_formats or frameworks-sonnet. Some got closed as FIXED and WORKSFORME. There's a bunch left. 2-3 have a point (e.g. the the language names), the rest is weird stuff. Re saving: The part of saving that was broken is writing the list to the rc file so that the next time the KCM opens it shows the selection. But the env vars startkde sources did get written. So applying the settings worked but UI state was borked. At least I think so, because I copied over the rc saving part and it didn't work until I fixed it up. It seemed like KDE 4 code - it was passing KConfig the option to write to kdeglobals, when there's a seperate plasma-localerc now. D12097 Make room for footer and header.